Walking down the empty streets. I don’t know what it is about this quote that resonates with me, but I love it. I think it has something to do with the certain level of contentment that can be achieved through merely being alone. So many people have said that writing is a lonely business to go into. However, what about for those people who enjoy time to themselves to mull over their thoughts? Is it as lonely? Or does it provide a sense of delight that allows you not only to mull over your own thoughts, but to hear how they sound when they’re spoken aloud? My favorite author, Jodi Picoult, has said that writing is an acceptable form of schizophrenia, and I believe that’s true in certain ways. However, as writers, we don’t view it as a negative thing. All we’re doing is trying to get on the same level as the words we’re writing in order to make sure that we are being as true and honest and authentic as possible. And what’s so crazy about that? If you could choose any book character to be real, which one would you pick? Between the Lines was Sammy’s idea, and frankly, she’s got a better imagination than I ever did at her age. It’s called Between the Lines, and it’s about what happens when happily ever after…isn’t. Delilah, a loner hates school as much as she loves books—one book in particular. In fact if anyone knew how many times she has read and reread the sweet little fairy tale she found in the library, especially her cooler than cool classmates, she’d be sent to social Siberia . . . forever.To Delilah, though, this fairy tale is more than just words on the page. Sure, there’s a handsome (well, okay, incredibly handsome) prince, and a castle, and an evil villain, but it feels as if there’s something deeper going on. And one day, Delilah finds out there is. Turns out, this Prince Charming is not just a one-dimensional character in a book. He’s real, and a certain fifteen-year-old loner has caught his eye. But they’re from two different worlds, and how can it ever possibly work? It’s an absolutely STUNNING book – with the coolest illustrations that remind of Arthur Rackham’s work from the turn of the century and silhouettes that take my breath away — in other words, it’s a book you want to keep on your shelves and just look at because it’s so pretty. But it’s also sweet, and funny, and charming, and it was a delight to have the experience of writing it with my own daughter! I’m incredibly excited for its publication and we’ll be on tour this summer to promote it! Even though I just started the book, I can already tell I’m going to love it. I mean, the basic plot involves a girl who finds out that the Prince Charming of the fairy tale that she’s read cover to cover multiple times isn’t just a character inside of a book. This simple idea got me thinking…if I could live inside of a book or if I could choose characters in a book to be real…which book/characters would I pick? Though normally this question would take quite a bit of thought from me, I know without a doubt which character and book I would choose to be real: Augustus Waters from The Fault In Our Stars by John Green. It’s the best book I’ve read this summer and probably one of my favorite books now (not counting older literature like Crime and Punishment by Dostoyevsky and other popular fiction like any book by Barbara Kingsolver). Augustus Waters from The Fault In Our Stars is my fictional dream guy. He’s intelligent, he reads a lot, he tells things how they are without sugar-coating them (but it’s an attractive quality and not something that’s ever hurtful to the girl in the story, Hazel), and he’s romantic without being overly mushy-gushy. As I was reading The Fault In Our Stars, on practically every page I’d think to myself: Why can’t Augustus Waters be real? I think at one time or another, everyone has imagined the possibility of their favorite fictional character being real. For me, at the moment, it’s Augustus Waters. However, a year ago it could have been a completely different character, such as Mr. Darcy from Pride and Prejudice. Come on though, what woman doesn’t want Mr. Darcy to be real? I know that I definitely went through a Mr. Darcy lovesick phase myself. So, now it’s your turn, if you could choose any character from any book to be real, which one would you pick and why? The Bookshelf Chronicles: Part Two. This past March, at the beginning of my Spring Break, my dad and I embarked on a trip to Ikea to purchase a wall of Billy Bookcases for my room. I realized yesterday that I never did a follow-up post to The Bookshelf Chronicles. 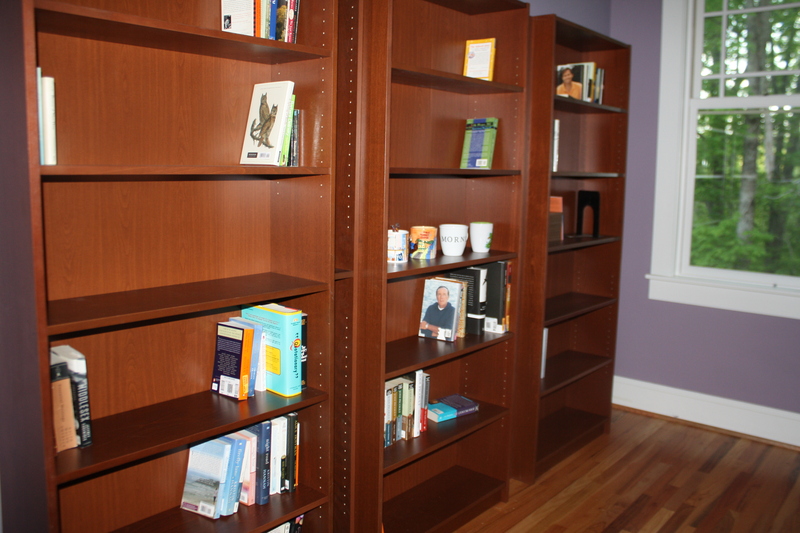 Yes, we (or more precisely, my dad) got the wall of bookshelves up, and boy are they pretty! I put my books in alphabetical order and put 2 letters to a shelf, meaning that A and B are on the first shelf, C and D are on the second shelf, and the third half while be used as spaced to put pictures or other knickknacks. Also, Jodi Picoult and Nicholas Sparks each have their own shelf since I have so many of their books. Anyway, with each of the three bookcases, there will be at least one shelf that will be for something besides books (to give it more of an artsy feel). As of right now, my bookshelves look relatively empty (and this picture doesn’t include the 20 or so books that I still have to shelve since I acquired so many more used books when at college in Asheville). However, I love all of the space because it just means that I have room for more books. Also, breaking up the shelves by each 2 letters will definitely help since I won’t have to shift my books around every time I have to add a new book to my collection. Since it’s now summer vacation for me, that means more time for pleasure reading. The first book of summer was Finding Daddy Cox by Mike Cox (one of my writing mentors that I mentioned in yesterday’s post, How Do You Deal With Criticism, Writer’s Block and Burnout? Anyway, I’ve been meaning to review Mike’s book, but I guess I just haven’t quite gotten around to it. Maybe that’ll be a post I write in a few days. Anyway, yesterday I was sitting in front of my bookshelves trying to decide what I was going to read next. I ended up choosing three different books in case I couldn’t seem to get interested in one of them: The Life All Around Me By Ellen Foster by Kaye Gibsons (Yes, Kaye Gibbons is the author. It’s a rather confusing title. ), Saving Max by Antoinette van Heugten, and A Moveable Feast by Ernest Hemingway. The Kaye Gibbons novel is one that follows one of her previous novels, which was simply titled Ellen Foster. I loved reading the previous novel many years ago (and I highly recommend it if you haven’t read it), but I’m anxious to read this follow-up novel by Kaye Gibbons because it portrays Ellen Foster’s struggles as a teen, as opposed to the abusive father that she struggled with in the first novel. A Moveable Feast is a book I’ve been wanting to read ever since I heard it quoted in City of Angels, a romance movie starring Nicholas Cage and Meg Ryan. Saving Max is one of the novels that I found when rummaging through the bargain books section at my favorite used bookstore in Asheville, Mr. K’s. It looked like an interesting read, so I decided to give it a try. Alright, well all these great books I have yet to read are calling my name, as is the comfy couch. However, I’d love to know how pleasure reading has been for all of you recently?